Did Nancy Pelosi Rip Republicans To Deflect From Her Own Guilt? Did Nancy Pelosi Rip Republicans To Deflect From Her Own Guilt? Did Nancy Pelosi Rip Republicans To Deflect From Her Own Guilt? 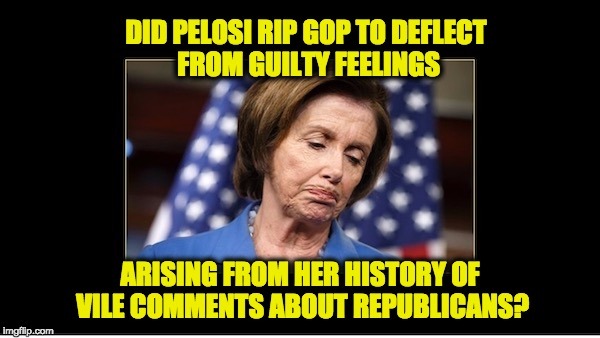 Was Nancy Pelosi bashing Republicans because she was experiencing some guilt due to of her long history of hate speech directed toward the GOP? It did seem that she was deflecting from her own abusive language when speaking to reporters on Thursday. Pelosi slammed Republicans who criticized liberal hate speech as a cause of the attempted mass murder of the Congressional Republican baseball team earlier this week. A reporter asked Pelosi to comment on the possibility that the shooting could be used politically against the Democratic Party because the shooter appeared to be motivated by anti-Republican sentiments. “Can you comment on the possibility that this incident could be used against Democrats or the Democratic Party politically because the assailant was apparently motivated by some kind of anti-Republican sentiment and we have heard comments from Republicans, including Congress, about vitriol rhetoric from the left being in some way to blame?” the reporter asked. Pelosi responded by calling Republicans’ comments outrageous. August 2009: I think [Obamacare protesters at Town Halls] they are Astroturf. You be the judge … carrying swastikas and symbols like that to a town meeting on health care. Note: there are many more examples where those came from. Poor Nancy Pelosi, the nation is demanding unity and the end to divisive speech by politicians. Many have realized that the source of much of that divisive hate speech comes from the Democratic Party, it can’t be long before people realize that SHE is a big contributor to that record of Democratic hate speech. That’s why she came out to rip the GOP on a day when most Politicians were calling a truce.